고배형 향완이란 구연이 밖으로 벌어져 넓은 전이 달린 몸체와 아래로 가면서 나팔형으로 벌어진 받침으로 구성된 형식으로서 대부분이 몸체와 다리 부분을 따로 주조하여 결합시키는 방법을 사용하고 있다. 이러한 향로는 명문에 보이듯 특별히 ‘향완’이라 명칭하고 기록하였음을 볼 수 있다. 특히 향로의 표면에는 범자(梵字)를 비롯하여 보상당초, 연당초, 운룡(雲龍), 봉황 뿐 아니라 회화적인 포류수금문(蒲柳水禽文) 등을 은입사로 화려하게 장식한 예가 많다. 전형적인 고려 향완에서는 원형 여의두곽(如意頭廓) 안에 범자문(梵字文), 연화당초, 연판, 당초 등이 시문되는 것을 볼 수 있다. 이 작품 바깥으로 벌어진 몸체의 전부 상면에 쌍구체의 유려한 당초문을 화려하게 시문하였으며 몸체 사면에는 여의두곽을 만들어 그 내부에 네 글자의 굵은 범자문을 입사하였다. 이 범자문 여의두곽과 여의두곽 사이를 유려한 연당초문으로 연결시켰다. 고려시대 고배형 향완은 대부분 노부(爐部)와 대부(臺部)를 별도로 주조하여 결합시키는 방법을 사용하고 있다. 이 향로 역시 노부 받침의 내면 중앙에 그러한 연결부를 볼 수 있다. 향완의 대부는 크게 노부받침과 나팔형의 다리, 그리고 대부받침의 3부분으로 구성되었다. 우선 연당초문이 시문된 노부의 하단에는 연판문을 둥글게 돌아가며 시문하였고 그 아래 붙은 받침은 2단의 몰딩형 턱을 두어 위쪽에는 간략화 된 당초문을, 아래 단에는 구름 형태를 간략히 시문하였다. 노부 받침 아래 붙은 다리는 아래로 가면서 점차 넓게 퍼지다가 끝단으로 가면서 1단의 둥근 몰딩과 그 아래로 둥근 받침을 형성한 모습이다. 다리의 상부면은 긴 종선으로 구획하여 그 내부 연잎마다 꽃술 장식이 첨가된 이 첨가된 복련(覆蓮) 형식의 연판문을 주회시켰다. 이 아래로 다리의 넓은 전면을 돌아가며 쌍구체의 연화당초문이 굴곡진 줄기와 함께 유려하게 시문되었다. 다리 아래 단 몰딩 부분에도 몸체의 전부 상면에 표현된 당초문과 동일한 형태의 쌍구체의 당초문이 전면을 돌아가며 시문되었다. 2단의 몰딩 부위 가운데 아래부분에는 여의두문이 첨가되었다. 이처럼 이 향완은 기본적인 외형과 은입사, 세부 문양에서 고려 후기 향완의 전형적인 형태를 잘 보여주고 있다. 특히 바깥으로 벌어진 구연 전부의 밑부분에는 ‘시주가선대부호조정인언 자○○ 정광후 정방사 시납 통도사(施主嘉善大夫戶曹鄭仁彦 子○○ 鄭光厚 淨房寺 施納 通度寺)’라는 연점각의 명문이 새겨져 있어 주목되는데 시주자 이름과 정방사, 그리고 시납 통도사 명문이 확인된다. 가선대부(嘉善大夫)의 직명으로 보아 조선시대에 시납된 것으로 추정되지만 고려시대에 만들어진 향완에 조선시대의 어느 시기에 와서 별도의 시주자 명단을 다시 추각했을 가능성도 배제할 수 없다. 이처럼 이 향완의 기록된 명문을 원래의 명문이 아니라고 판단한다면 그 제작연대는 14세기 중엽에서 후반 쯤 제작된 것으로 추정된다. 이는 조선 전기의 대표적인 작품인 국립박물관 소장 청곡사(靑谷寺) 향완(1397)과 비교해 보아도 그와는 다른 고려적인 요소가 대부분 잔존하고 있기 때문이다. 따라서 조선시대 전기의 향완이라고 알려져 왔던 지금까지의 견해와 달리 이 통도사 소장 향완은 앞서와 같은 고려 후기 향완을 충실히 계승한 작품으로 새롭게 파악될 수 있으며 보존상태 또한 매우 양호하다. 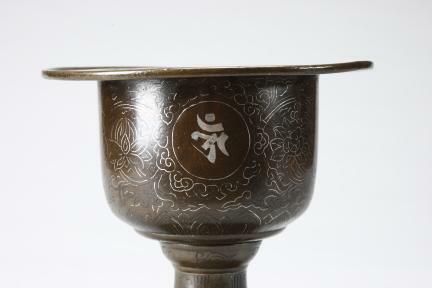 In Goryeo, bronze incense burners in the shape of a mounted cup were widely manufactured, along with celadon incense burners. Incense burners of this type have a broad outward-turned rim and a foot that flares like an upside-down tulip. They are most often made by putting together a separately cast bowl and foot. These incense burners were called “hyangwan,” as it is besides written on the surface of this one. The surface is often sumptuously decorated with silver-inlaid Sanskrit characters and designs like honeysuckle and scrolls, lotus and scrolls, dragons amid clouds, phoenixes or willow and water fowls. 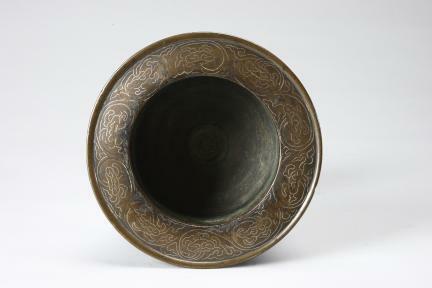 Initially, the surface design on a mounted cup-style incense burner was simpler and limited to some localized areas, as exemplified by the Incense Burner of Baegwolam Hermitage (1164). Once into the late Goryeo Period, they became more lavishly adorned with decorative motifs, and motifs were present throughout the entire surface including the surface of the foot. The foot was shorter than in earlier eras and had a shape that conveyed a bit of a tubby impression. This style, besides, remained in use, into the Joseon Period. 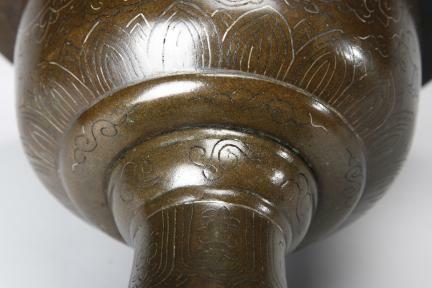 Incense burners, in a typical Goryeo style, are decorated with yeouidu motif-framed circles enclosing Sanskrit characters and lotus petal and scroll designs. In this incense burner, the upper section of its flared-out body is sumptuously adorned with elegant scroll designs. The side of the incense burner is decorated with yeouidu framed circles in which four Sanskrit characters are inlaid with silver wire. The circles enclosing Sanskrit characters are interlaced with lotus and scroll designs placed between them. 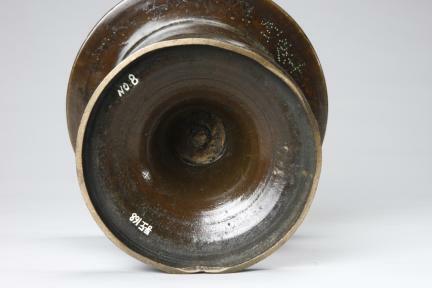 Like most mounted cup-style Goryeo incense burners, this one is also made by welding together the bowl and the foot that were separately cast, as indicated by the weld seam visible at the bottom of the bowl. The foot is made up of three components; the bowl rest, the foot proper and the base. The bottom of the bowl is decorated with lotus petal motifs, at the level beneath the area with lotus and scroll designs, and the bowl rest has two molding-style ledges with simplified scrolls on the top ledge and cloud motifs on the bottom ledge. 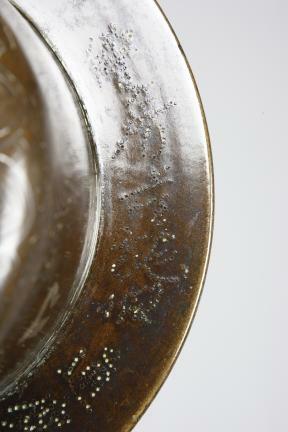 The foot, below the bowl rest, flares outward gradually to a broad, round base with one bevel. At the upper level, the foot is divided by long vertical lines into several sections inside which downward-facing lotus petals with stamens are placed. In the area below, the surface is covered with magnificent lotus and scroll designs with sinuous vines. The same scrolls are added to the bevel around the base. Meanwhile, the scroll design along the bottom ledge of the bowl rest area is coupled with yeouidu motifs. 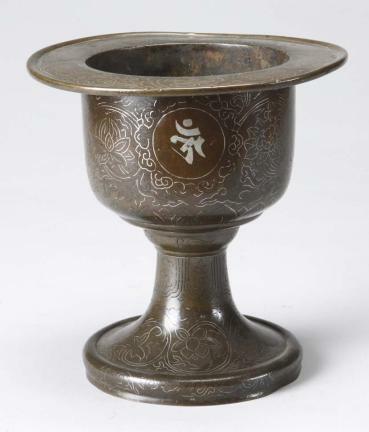 All in all, this silver-inlaid incense burner is eminently illustrative of the style of late Goryeo bronze vessels of this type, especially in surface design. Beneath the mouth rim, there is an inscription in dotted characters, providing the names of donors and mentioning Jeongbangsa Temple and Tongdosa as the temple to which the incense burner was originally offered. Meanwhile, the tile “Gaseondaebu” in the inscription suggests that the incense burner was probably housed in Tongdosa sometime during the Joseon Dynasty. Another possibility is that the incense burner was made during the Goryeo Period, but the list of donors was inscribed on it at a later era. If indeed this inscription does not date from the time when the incense burner was cast, the only way to determine its age is comparing it with similar incense burners that are dated. Although rather modest in size, this incense burner is elegant and features a slender and finely-proportioned foot. This, coupled with the beautiful lotus and scroll design and the contrastingly meek Sanskrit character design, suggests that the incense burner was made sometime in the mid-14th century. When compared to an early-Joseon incense burner like the one from Cheonggoksa Temple (1397) – currently in the collection of the National Museum of Korea – this incense burner shows a much stronger degree of Goryeo influence. Only a handful of dated incense burners have survived from the 14th century, including the one with the inscription of “Junheungsa” from 1344 (4th year of Zhizheng) and another from 1357 (the 17th year of Zhizheng). Therefore, contrary to the widely held view that it was made in early-Joseon, the incense burner of Tongdosa Temple appears to have been created in late Goryeo. The incense burner is, otherwise, in an excellent state of preservation.